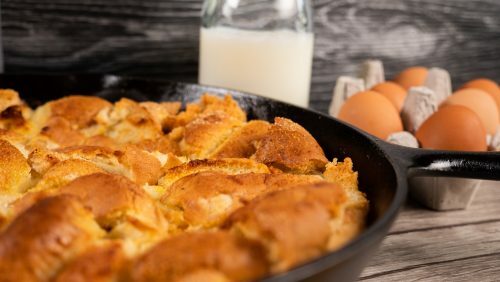 You are at Home Recipes Bread Pudding – The Perfect Go to Dessert! One of my favourite dessert of all time is bread pudding! I love how simple the recipe is and for the most part, you usually have all the ingredients at home already. I also love how you can use up for old bread that might be getting a little dry so you don’t waste any food! When I researched a little more about bread pudding, it seems like all cultures have their own variation of this delicious dessert. In some Canadian recipes, a little maple syrup is added. In Hong Kong, it is usually served with some vanilla cream. In Cuba, they add a guava marmalade! Yum! Whatever variation you try, you really cannot go wrong with bread pudding. 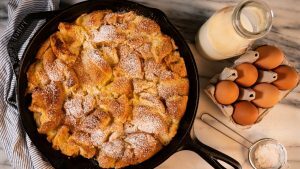 Bread Pudding - The Perfect Go to Dessert! Remove from oven and let cool. Serve with a dusting of icing sugar and some ice cream!